Lunch time on day three of my lazy staycation, but I can still cook. Now I am not much of salad eater and do not care for salads as a main course. A good salad too me is a strip steak with a piece of parsley on top. Once in a while you come across a salad that it is not only delicious, but is perfect with a little meat in it. This is one of them. While I am making it as the main course for lunch it would also be perfect as a side dish as well. Fill a large soup pot with water. Add a pinch of salt and pepper and bring to a boil. While you are waiting for your water to boil, cut your ham slices into 1/2 inch cubes, and your banana peppers in to 1/2 inch squares. After straining the water from the mushrooms place the mushrooms, ham and peppers into a mixing bowl. Now take your lemons and grate the skin to obtain the lemon zest and mix into your bowl with the other ingredients. For your dressing pour a 1/4 cup of the extra virgin olive oil into a small mixing bowl. Squeeze the juice from the lemons into the olive oil that you grated earlier for the lemon zest, and add your garlic and basil, and a pinch of salt and pepper, then stir in until incorporated. Leave to the side at room temperature. By now the water should be boiling. First add the peas and white beans, along with the liquid brine from the can the white beans were in, to the boiling water. You are only going to boil for 1 1/2 minutes. 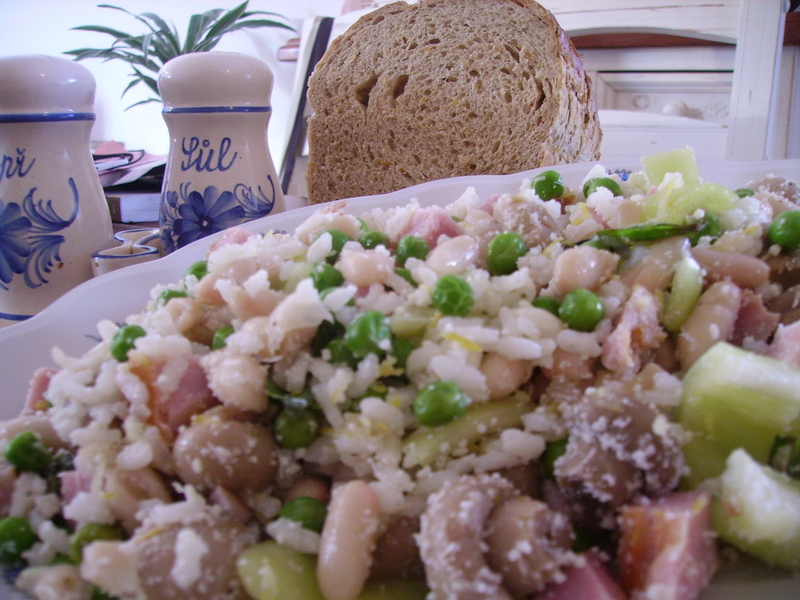 When the time has passed, using a spoon with wholes or a small hand colander remove the peas and beans from the pot, without throwing out any water, and place them in the bowl with the ham, peppers, and onions. Stir until all ingredients are mixed. After removing the beans and peas from the water, ensure the water comes back to a boil and add your rice. Cook for about 15 minutes. You do not want the rice to cook all the way through. When the rice is done pour into a colander and immerse into cold water to cool and stop the cooking process. Pour rice into a shallow pan along with the rest of the ingredients in your bowl, as well as your grated romano cheese, another pinch of salt and pepper and mix together. Let stand until rice is room temperature. Plate your Risotto salad and only slightly drizzle the dressing you made over top of the Risotto Salad. 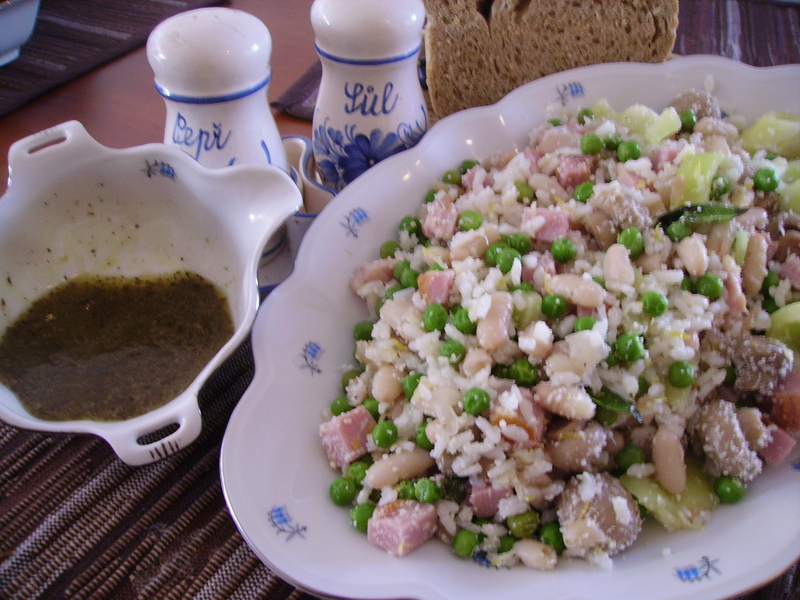 This entry was posted in Banana Peppers, Basil, Button Mushrooms, Extra Virgin Olive Oil, Garlic, Ham, Olive Oil, Pepper, Recipes, Risotto-Salad-With-Ham-Peas-&-Peppers, Romano Cheese, Salt, Sauces & Marinades, White Beans. Bookmark the permalink. Thanks Rufus 🙂 Hopefuully it won’t be a virtual spring. This looks awesome. I’d eat it at my virtual dinner party, but I’d rather eat it at a real one.